The winter sunlight glistens off the snow white fur coat of a polar bear who was seen near Camp Nanuq in the Hudson Bay region in Churchill, Manitoba. A beautiful species of wildlife, a Polar Bear is one of the world's largest land carnivores and are considered as marine mammals as they are semi-aquatic and can survive in the sea, on land and on the ice where they find their gourmet meals of ringed seal. 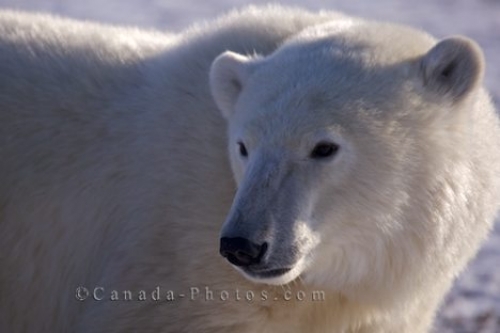 Picture of a Polar Bear, a species of wildlife found in the Hudson Bay in Churchill, Manitoba, this one spotted near Camp Nanuq. This close up picture is beautiful as it allows people to see the small, rounded ears, dark black eyes and long nose which is very sensitive to different scents, all common characteristics of a Polar Bear.